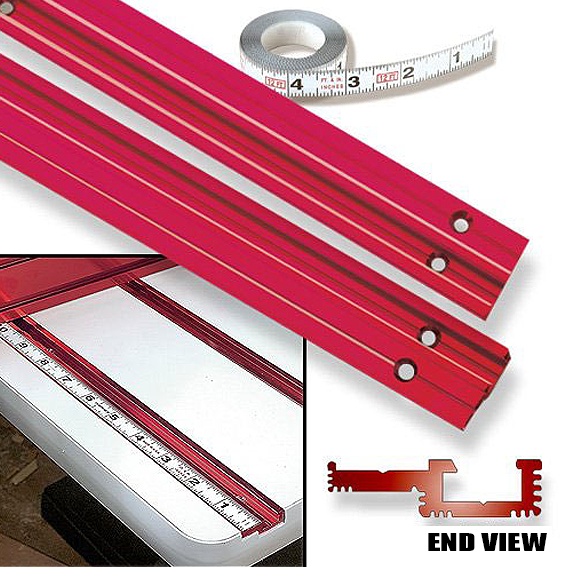 Hart Design Utili-Tape Trak - 17"
Set the position of fences, stops, clamps, and jigs exactly! Utili-Tape Track merges a versatile t-track slot with a built in tab for adding a 1/2" wide self-adhesive measuring tape (sold separately). Now you can have a built in reference for making settings and fine adjustments. Pre-drilled and countersunk for screw in installation. Ridged for extra holding power to epoxy the track in place if you desire. Stepped track has an overall width of 1-1/4" and is 3/8" thick on it's thickest side. Imported. Hart Design Utili-Tape Trak - 12"